Geraint Thomas can one day emulate Sir Bradley Wiggins and add the Tour de France title to his Olympic golds, says former Team Sky coach Sean Yates. The Tinkoff-Saxo sports director had to watch in frustration on stage 12 as Thomas helped Team Sky leader Chris Froome maintain his Tour advantage. Froome is 2 minutes 52 seconds ahead of his nearest challenger and 4mins 4secs ahead of Tinkoff's Alberto Contador. 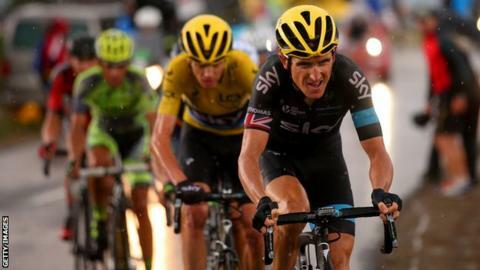 "Geraint Thomas is a phenomenon, he's a one of a kind almost," Yates said. "Obviously Bradley Wiggins has won Olympic medals and won the Tour de France, and Geraint looks like he can follow in his footsteps in the long term." Thomas - a team pursuit gold medallist at the Beijing and London Olympics - fulfilled his domestique duties brilliantly on the gruelling 15.8km climb up Plateau de Beille on Thursday. The Welshman, 29, helped Froome absorb continued attacking breakaways by his rivals and still held on to his own fifth place in the general classification. "[Team Sky] are a very strong team; they showed that the first day, they showed that in the past," added Yates, a stage winner in the 1988 Tour de France. "We've got to keep fighting for the podium to move up one step at a time and you never know what could happen. "It wouldn't be the first time that the leader had a really bad day and lost time, lost some team-mates... you just don't know."